In this excerpt from The Age of Spiritual Machines (Viking, 1999), Ray Kurzweil writes about the development of Kurzweil Music Systems. I kept up my relationship with Stevie Wonder, and on one of our get togethers at his new Los Angeles recording studio in 1982, he lamented the state of affairs in the world of musical instruments. On the one hand, there was the world of acoustic instruments, such as the piano, violin and guitar, which provided the rich complex sounds of choice for most musicians. While musically satisfying, these instruments suffered from a panoply of limitations. Most musicians could play only one or two different instruments. Even if you could play more than one, you couldn't play more than one at a time. Most instruments only produce one note at a time. There were very limited means available to shape the sounds. On the other hand, there was the world of electronic instruments, in which these control limitations disappeared. In the computerized world, you could record one line of music on a sequencer, play it back and record another sequence over it, building up a multi-instrumental composition line by line. You could edit wrong notes without replaying the entire sequence. You could layer multiple sounds, modify their sonic characteristics, play songs in non-real time, and use a great variety of other techniques. There was only one problem. The sounds you had to work with in the electronic world sounded very thin, rather like an organ, or an electronically processed organ. Wouldn't it be great, Stevie mused, if we could use the extraordinarily flexible computer control methods on the beautiful sounds of acoustic instruments? I thought about it and it sounded quite doable, so that meeting constituted the founding of Kurzweil Music Systems, and defined its raison d'être. 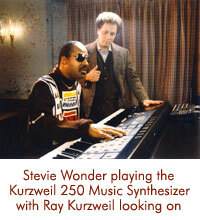 With Stevie Wonder as our musical advisor, we set out to combine these two worlds of music. 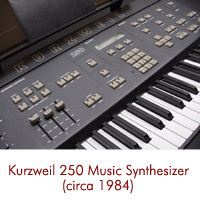 In June of 1983, we demonstrated an engineering prototype of the Kurzweil 250 (K250) and introduced it commercially in 1984. The K250 is considered to be the first electronic musical instrument to successfully emulate the complex sound response of a grand piano and virtually all other orchestral instruments. I sold Kurzweil Music Systems to a Korean company, Young Chang, the world's largest piano manufacturer, in 1990. Kurzweil Music Systems remains one of the leading brands of electronic musical instruments in the world and is sold in 45 countries.